Each day, there are over 2,000 individuals here in Australia receiving skin cancer treatment, says Dr. Sally Phillips, TAL general manager of health services. We’re talking about 750,000 people each year. If we just took simple precautions to protect ourselves, this number would be much lower. Of course, not everyone needs need to have a skin screening annually. But if you are at high risk of skin cancer, you should make a commitment to yourself to get an expert skin check every year to help with early detection — that’s one way to start protecting yourself. So how do you know you’re at high risk of skin cancer? The answer lies in the type of skin you have and your risk factors. With early detection, skin cancer is nearly 100% treatable. But when skin cancer is left to spread on the skin, it becomes life-threatening. Some individuals have more of a risk of melanoma because their skin type has a higher sensitivity to UV damage. Those with fair or red hair and light-coloured eyes are at an increased risk when you compare them with individuals with darker eyes and hair. 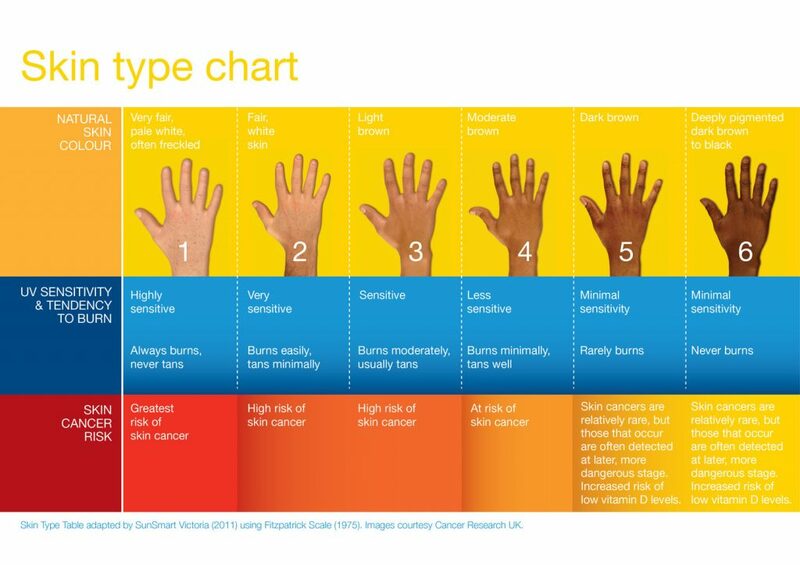 For a visual of skin types and their UV sensitivity, tendency to burn, and skin cancer risk, take a look at this Skin Type Chart provided by SunSmart Victoria. Have you done some self-checking for your skin? To see if you’re at a higher risk for skin cancer, you can try our risk assessment model readily available on our MoleMap website. Again, not everyone will need to get a yearly professional skin check, but those who are at high risk should. If you are a high risk to develop skin cancer, book a MoleMap for early detection by an expert dermatologist. A MoleMap will provide you a spot check, skin check, or a full head-to-toe skin check of any and all moles to check for signs of melanoma and other skin cancer. If spotted, you can begin treatment as soon as possible to increase your chance of survival by almost 100%.